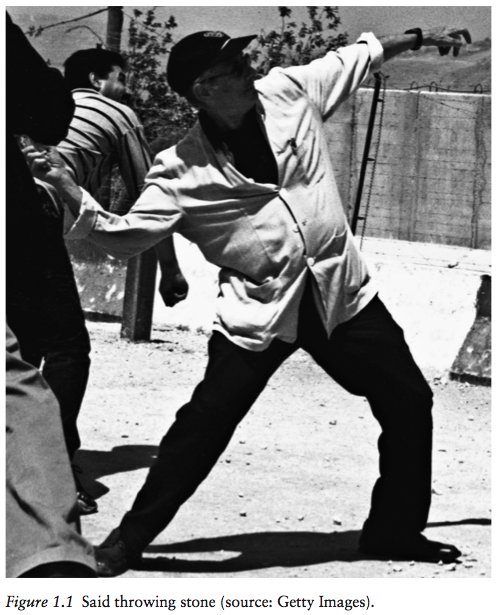 Edward Said was often photographed. He had a knack for organizing the image, typically appearing as a richly upholstered six-footer, his bold stripes and patterns from a Savile Row tailor, hair like black whipped cream. Hearts throbbed for him. But the best-known image is very different. In it, he is throwing a stone at an Israeli guardhouse. Instantly published around the world, this photo instigated calls for Said’s dismissal from Columbia University with a corresponding passionate rush to his defense. No other photo captures so economically Said’s ability to make your head snap back and wonder, Can he really get away with that? Said’s career blended erudition, pride, audacity, eloquence, magic, power, and a good location. A prominent, self-declared Western humanist, presenting himself as a raging Jeremiah or a Romantic outsider—the Manfred of Lord Byron, stalking the Higher Alps and spitting poison at Europe; or a Jonathan Swift, gnashing imprecations at Western civilization. To put it like that announces the self-division that cleaves Said’s whole enterprise. He was Western to the bone. His chosen doubles were Western heroes, riven and tormented figures such as Lawrence of Arabia, whose self-description as “a standing civil war” fascinated Said because it named his own condition. His interest in bisected eccen- trics, the Genets, Vicos, and Conrads, lay in his quest to avoid the fateful stalemating of the contradictory gifts he saw in Lawrence, a civil war fought to a standstill. Said’s intractable contradictions produced a kind of restless energy—and no end of academic tut- tutting from his more cautious colleagues—but nothing held him back. He was, of course, an intellectual rake, a fundamentally unpredictable character whose ultimate professional and cultural centrality never extinguished his charming eccentricity. Guillory shows how badly the Weberian paradigm fits academia. Not only are literary critics sadly incomparable to Jesus Christ, they also develop exclusively within the institu- tions that train, house, reward, package, and market them. Unlike religious charismatics, critics are inseparable from their institutional wrappings. Harold Bloom would not be Harold Bloom were he working at Burger King. His identity resides in his institutionality: he is Yale Professor of English Harold Bloom. And that is true, mutatis mutandis, across the board. Derrida would not be Derrida were he not J. Derrida, agrégé of the École Normal Supérieure in Paris. Quality presses (such as Harvard or Gallimard) make their own contribution to a grow- ing reputation, as do TLS or the London Review of Books, by providing prominent reviews that in turn produce invitations to speak at “R-1 [Doctoral research]” universities. Only a broad, expensive, coordinated effort can give a lowly English professor the pearly luster of charisma. It happens only to a few. And those few are produced: they do not produce themselves. Two events occurred around 1981, just as Said achieved the first peak of his notoriety. One was the rise of literary theory superstars who attracted the attention of the general literate public. The other was a debate over literary professionalism. Guillory offers a plausible explanation for the first. Theory stars were, he writes, “the free agents of pure charisma. It is not difficult to see that the deployment of this category was driven by the interests of competitive university administrations, for whom the content of theory, subversive or otherwise, was largely irrelevant.” He concludes, “What mattered was that the charisma of the master theorists could be converted into bureaucratic prestige” (1993: 254–255). In Said’s case, by 1981, the thirty- two-year- old tennis- playing clotheshorse of 1967 was well on his way to demiurgic status. Bourdieu’s materialist version of charisma suggests just how that happened. Bourdieu offers an amusing account of the typical professorial gestures and tricks: “verbal acrobatics, hermetic allusion, disconcerting references or peremptory obscurity, as well as the technical tricks ... such as the concealment of sources, the inser- tion of studied jokes or the avoidance of compromising formu- lations.”6 He might well have added to the list the professorial practice of grandly denouncing his own profession. American critic and fervent pro-professionalism gladiator Stanley Fish was always particularly incensed by this ritual of self-flagellation. The institutionally created critic- professor is actively encouraged to display independence, even to the point of attacking the institution itself. Doing so enhances the university’s own socially consecrated role as the sanctioned place for freedom of speech. Said’s own exhortations for professorial courage must be seen in this light. The final chapter of his manifesto on the intellectual vocation, entitled “Speaking Truth To Power,” identifies himself as one of a tiny band “whose stentorian voices and indelicate imprecations are hurled at humankind from on high” (RI 7). He is “someone able to speak the truth to power, a crusty, eloquent, fantastically courageous and angry individual for whom no worldly power is too big and imposing to be criti- cized and pointedly taken to task” (RI 8). He is “someone whose place it is publicly to raise embarrassing questions, to confront orthodoxy and dogma (rather than to produce them), to be someone who cannot easily be co-opted by governments or corporations” (RI 11). Much more of the same follows, in this book and elsewhere, but that last phrase deserves careful attention. Bourdieu’s measured account of charisma as a valued corporate commodity renders Said’s idea that intellectuals can avoid compromise with governments and corporations romanticized, if not selfcontradictory. A look at Said’s own record proves Bourdieu right. Whenever Said broke with norms of decorum, his employer, Columbia University, sprang to his defense. After he threw his famous stone at Israel, and calls were heard for his disciplining and dis- missal, the University Provost Jonathan Cole issued a public defense of Said’s right to “speak” and gave no inch of ground to his critics. Said supporters hailed Columbia for this act of rare courage. By this means, the university further established its pristine integrity as a utopia of individual freedom, where even the upper administration could speak its mind without constraint. Some insiders even saw Cole’s letter as a throwback to feudal standards of personal loyalty: after all, Cole was Said’s squash partner. But the hard-hearted might conclude that neither love nor Romanticism nor an anti-corporate impulse made Columbia defend Said. Other Said-inspired upheavals, such as the revelation that he had exaggerated some details of his past, were also instantly slapped down by Columbia. After devoting so much institutional energy and authority to establishing so charismatic a professor, the university was determined to protect its invest- ment. Said was fond of saying, with a conspiratorial twinkle in his eye, “They let me get away with this because I dress so well.” The truth is that “getting away with this” was precisely what Columbia paid him handsomely to do. Accepting Bourdieu’s reading deflates Said’s proclamations of the courage demanded to speak truth to power. “If the institution tolerates and so strongly encourages disrespect for the accessories and even the institutional rules,” writes Bourdieu, it does so in “the service of the institution and through it the institution’s social function” (Bourdieu and Passeron 1977: 124–125). Unsurprisingly, that function is the conservative one of reproducing the social system as it is. For Said, real intellectu- als (read: himself and his followers) stand alone while throngs hurl insults and labor ceaselessly to bring these heroes low. But his football-coach-like commands to show steely courage when telling off the institution belong to the scripted routines of professorial conduct. Far from subverting the social and political norms, these fervent proclamations—always delivered in a sea- soned preparatory-school bark—strengthen the power that they hope or purport to oppose. The stone- throwing episode marked the end of Said’s political arc and the planetarity of his charisma. Completely apolitical until 1967, he entered the public fray as a writer trying to correct misperceptions of the Arab peoples that had come to his attention during the “six-day war.” He excelled in this as-yet- unnamed cultural criticism, and his successes brought him to the center of PLO power. By 1974 he knew Yasir Arafat and the PLO elite. In 1979 he was meeting quietly with U.S. Secretary of State Cyrus Vance and almost worked out a deal for an independent Palestinian state. Throughout the 1980s he hob- nobbed with MacNeil and Lehrer, Ted Koppel, Phil Donohue, and other media machers. He debated ambassadors and heads of state. By 1990, he had taken on the aura of a political prophet.